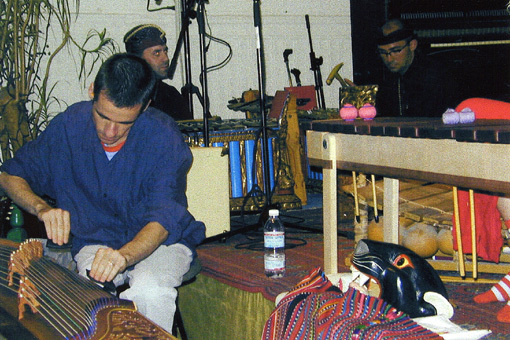 The OPEYE ORCHESTRA, an expansion of the free-improvising group, OPEYE, will perform on Saturday May 25, 2002 at 8:00 PM at Tuva Space in Berkeley. Participants include HENRY KUNTZ: tenor saxophone, rhaita (Morocco), Chinese musette, wood flutes, toy violins (Mexico), Bali & Java gamelans; DAN PLONSEY: Turkish oboe, clarinet, tenor & baritone saxophones; CLEVELAND PLONSEY: flute (slide whistle); MICHAEL ZELNER: clarinet, alto saxophone, flutes and pennywhistle; ESTEN LINDGREN trombone, trumpet, drums, and percussion; JOE SABELLA: tuba; RON HEGLIN: tuba, trombone; SUKI O’KANE: xylophone, balafon, marimba, percussion; BRETT LARNER: koto, zheng; HIRAM BELL: ukulele, clarinet, alto saxophone, harmonica, piano; JOHN KUNTZ: ukuleles, guitar, mandolin, gamelans, percussion; BRIAN GODCHAUX: violin, viola; BOB MARSH: cello; JEFF HOBBS: violin; NANCY CLARKE: violin; JEFF PURMORT: Balinese gamelan instruments; MARK SALVATORE: Balinese gamelan instruments; Ben Lindgren: painting. The OPEYE ORCHESTRA is an experimental offering, extending the collective, world-based aesthetic of the group, OPEYE, to a larger ensemble. 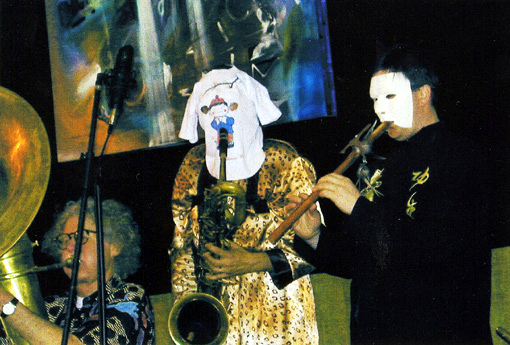 That aesthetic is steeped in the traditions of jazz, but players draw on their total life experience to incorporate cultural elements of various traditions, including extra-musical elements such as the use of masks, costumes, painting, and textiles. This type of improvisation is different from the typical jam where one finds a rhythm section laying down a unified beat and sequence of chord changes and only one or two players are actually freely improvising. With the OPEYE ORCHESTRA it seems that almost nothing is preplanned, and much of the time everyone is playing on their own, performing melodic lines or rhythmic figures that could stand on their own. These lines often combine in very random-sounding ways. This can, of course, sound incredibly chaotic. This chaos resolves in various ways, some of them internal to the listener. At some points in the music, two or more players will catch a relationship between the lines each of them has played, and will develop that. This can be as simple as unifying on a single sustained note or a simple rhythm pulse. On Saturday, there were several times when this would happen, with other members of the group joining in on the shared idea to create a sonic island of order in the river of chaos. There were two ways that I experienced a resolution of the sonic chaos that didn’t seem to involve any change on the part of any of the performers. 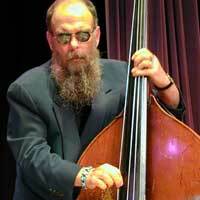 The first, which came very naturally to me, was to start paying attention to one of the improvisers for a while. When I would look at a given player, that player’s line became something of a focal point for me, and the other sounds and melodies swirling about could become something of a background.As a musician, it was instinctive for me to watch and listen in this way. But I learned that this was far from the most revealing way to experience this music. At the break, MZ recommended that I spend some time listening with my eyes closed. I took his advice during the second set, and this was when chaos resolved most satisfyingly. Suddenly my attention became much more focused on the whole, rather than on any one line. It was as if I had been staring at one or two pixels on a video screen, and now I’d allowed myself to back up and shift my focus to see the texture and color of the entire picture and the constant changes therein. Here is where the trancelike state began to come into being. I now wish I’d spent more of the listening time in this mode, actually. It’s something I’ll keep in mind in the future. I highly recommend the OPEYE ORCHESTRA to anyone with adventurous ears (and eyes). I hope they schedule another performance in the near future! 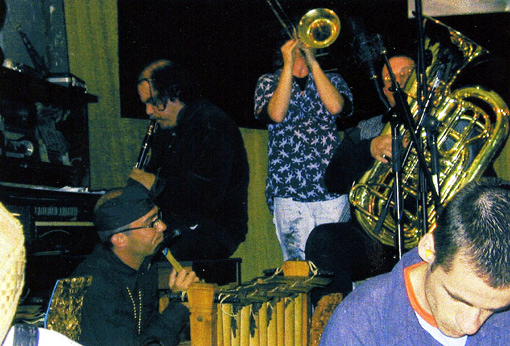 The OPEYE ORCHESTRA is an improviser’s orchestra, rooted in (and hopefully extending) the world-based free improvising aesthetic that has evolved in the group OPEYE. The name “Opeye” itself is a reconfiguration of “opi”, the Latin plural of “opus”. Early on — for want of a better term — we referred to the improvised pieces of music that we were playing as “these opi”. 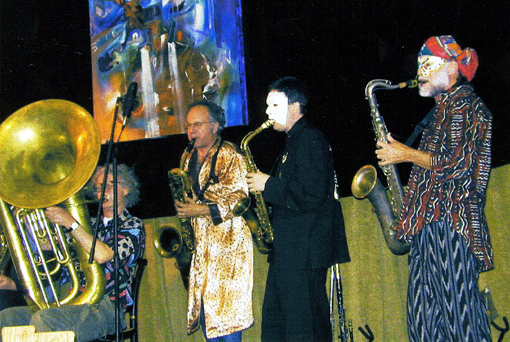 The name signifies that the fundamental musical approach of the group is based in free improvisation; its reconfiguration is meant to suggest that the roots of this improvisation are not culturally specific but extend naturally to encompass all that each player has experienced and presently embodies in his or her musical life. Along with expanding the range of instruments available for improvisation in a cultural sense, we have been working to expand the formal bounds of improvisation itself. As a group, we have been consciously moving away from what I think of as a lowest common denominator approach to the ways players relate to each other in an improvisational setting. That is, we are not attempting to coalesce musically around some lowest common denominator note, scale, melody, rhythm, or whatever. Rather, we are attempting to bring to collective improvisation the formal complexity of a string quartet, wherein each players role is a complete role, perhaps even able to stand alone, yet at the same time absolutely essential to the group music. To achieve this new level of complexity, we are attempting to bring all of our musical knowledge and experience to the forefront, making each choice of what to play, when to play, or even whether to play, as conscious as possible. The OPEYE ORCHESTRA is a first experiment to find out how well this approach can work with a larger ensemble. It is, in a sense, a social as well as musical experiment since it explores the maximum freedom that individuals may attain within a group while still maintaining the cohesion of the group. 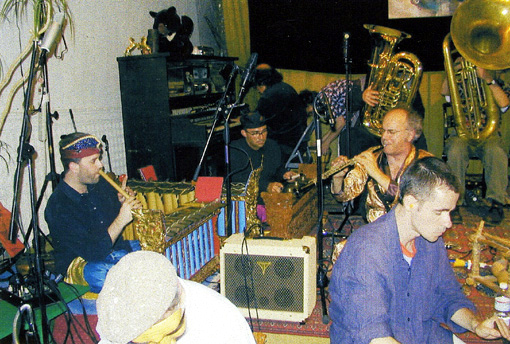 The idea of putting together the orchestra stems from a period several years ago when I was creating a number of 4-track recordings of improvisation, using concepts such as those outlined above but also combining instruments from different places and cultures that would never actually be heard together or even instruments from within a particular culture (Bali especially) that would never be heard together because they come from different types of orchestras. I created a piece, for example, using 2 metal gamelan instruments from Bali (from 2 different types of orchestras) and 1 from a Java along with a Balinese wood gamelan, another piece using 3 toy violins and 1 unusual hollowed-out log violin from Mexico, another piece using flutes from three geographically separate cultural regions along with the wood gamelan, and other creations along similar and different lines. But I started to want to hear all of these things together. So the idea of the orchestra was born. Perhaps the most interesting thing that occurred in creating these recordings was that the results of these unlikely instrumental combinations were rarely predictable. I expect that this may be the same with the OPEYE ORCHESTRA. What happened is that when one combined instruments in an unfettered manner, without attention to finding scales that matched or attempting to re-tune things to be more “agreeable’ in a western classical sense, whole new musical landscapes appeared. Sometimes, it simply happened that, like in an interlocking Balinese orchestra, the speed of things would get doubled or tripled, then new “harmonies” would appear along with strange rhythmic figures, and then one’ s hearing changed in relation to what had been created, and that in turn would influence the next creation. 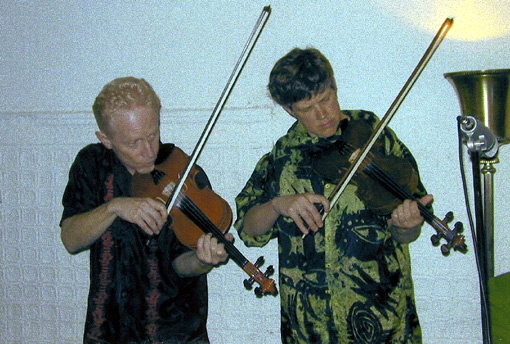 I am suggesting, then – based on this experience – that players take a similar approach to playing in the OPEYE ORCHESTRA, allowing instruments with different tunings, scales, etc to be played more or less as they are, not attempting to alter them much to “fit in.” In this way, we can allow whatever new music is latent in this particular ensemble to find its way into being. In choosing players for the OPEYE ORCHESTRA, I had in mind several things: I looked for players who were familiar with my own music and that of OPEYE, I looked for players who I knew to be experienced improvisers, and I looked for players who had some experience playing with one or more players in the group. I also invited players to participate based on instrumentation. I wanted more gamelan players, more string players of both plucked and bowed strings, more low brass, more low and high reeds and double reeds, and wooden percussion. We have all of this, and I think this will allow for enough differentiation of sound and inherently different approaches to instruments to keep the sound from becoming overly muddy, even with so many (16) players. 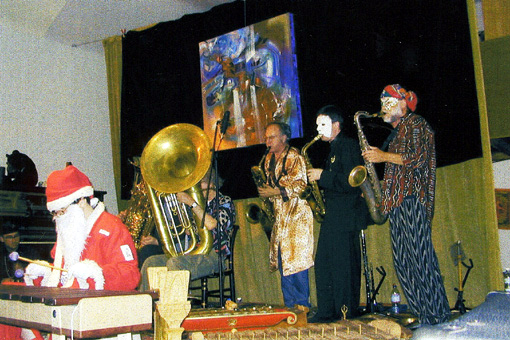 Some of the different instrumental possibilities I hear in this ensemble have to do with high and low Tibetan horns, high squeaky reeds and low brass such as in large Mexican orchestras, a shadow play ambience created by the gamelans (no matter if they are mainly of “pelog” origin), the stateliness of the old Japan and the acoustic sine wave possibilities of the new (extended by high clean saxophone and violin tones), a sense of Africa (or perhaps even of Thailand) coming from the xylophone and balafon, a great deal of fluidity coming from the large string presence, and a complex sense of this world’s real music suggested by the combination of everything. Instrumental archetypes for the orchestra in terms of complexity of musical approach might include certain types of Thai classical music (the piphat orchestra especially) wherein players play an amazingly complex melodic/percussive music, each player proceeding at a different tempo toward the same musical end. It is also useful, I think, to incorporate elements of what I call “festival form,” where completely different sound events might be occurring within the same space at the same time, although each is fundamentally important to creating the whole space. In Bali, for example, two different types of ensembles may be playing at a temple festival at exactly the same time, say a large dance ensemble along with a small shadow play group, or there may be groups both inside and outside of a temple playing different music within easy earshot of each other. 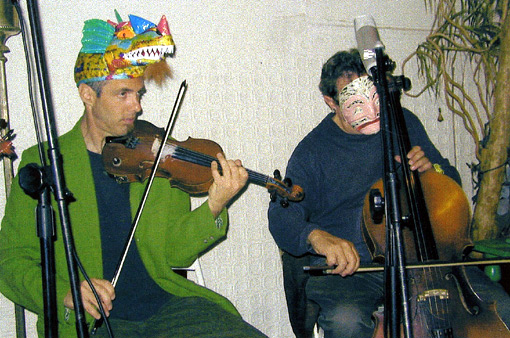 There was also an unforgettable festival I attended some years ago in Bolivia where three or four different drum-and-panpipe ensembles played entirely different music at the same time, moving in circles alongside each other. As for visual and costuming elements associated with OPEYE, these came about in the first instance because we were interested in a visual presence that could be more of a parallel to the music we were playing. It seemed ludicrous to be playing a radical, out-of-cultural-context music while at the same time appearing in blue jeans and t-shirts or some such equivalent. Also, I realized that when I’d attended certain festivals in other cultures, one of the most striking things about them was the visual impact they left. In the Bolivian festival I alluded to above, the participants were dressed in myriads of bright colors with hats surrounded by tall multi-colored feathers. One group was topped by a sea of pink, all from pink flamingos. 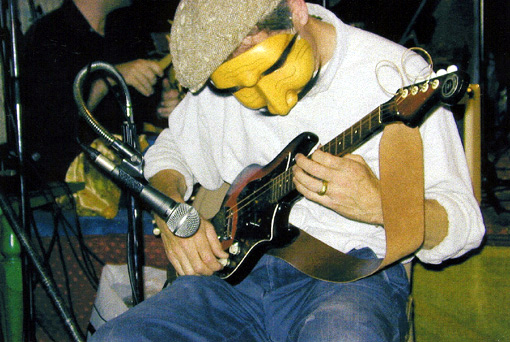 So this has evolved over time into the incorporation of actual costuming, the use of masks and the incorporation of masks into the performance for their own sake and quality. We’ve particularly used animal archetypes as a way of connecting beyond the urban environment and back into the natural world. We have also frequently called upon the archetype of the Balinese and Javanese shadow plays as a way of framing aspects of performance and a way of seeking balance between all the forces of nature and within ourselves. In the end, it usually amounts to something akin to a surrealist dream, wherein which various visual offerings may or may not seem to make sense but yet there is a kind of sense to them. In any case, I encourage players in the orchestra to participate in this aspect of the performance if they are comfortable doing so. Even some small attention to dress will go a long way to place what we are doing out of the realm of ordinary cultural discourse. I have also often stressed the ritualistic aspect of improvisation because one of the defining features of it is that it is music marked by its “time of duration” rather than by formal structures or by some previously agreed upon imperatives about where it should start or end. This is similar to ritual musics worldwide whose main function is to temporally define ritual space by means of sound. These are not musics, however much they’ve been thought out ahead of time, that people particularly even actively listen to, and yet they are the “glue” which holds these ritual spaces together, sometimes for hours at a time, sometimes for a night, sometimes for days! 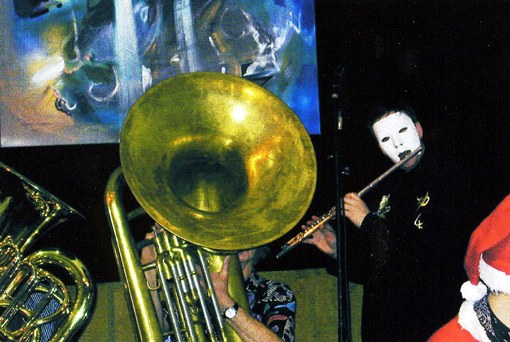 This durational aspect of improvisation coupled with the attention to detail necessary to creatively improvise also tends to induce trance-like qualities in those playing it. 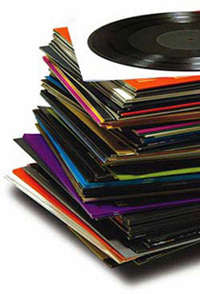 Players often find themselves playing things that they did not “know” they could play or did not previously “think” of playing – so that at some point, although the players continue to be actively involved in the music, the music actually begins to take on a life of its own and to “play itself”. We hope to approach this level of improvisation in the OPEYE ORCHESTRA. As for details, two sets of music are planned on May 25th, of about 40 minutes each. How the music will actually transpire with this group, I’m not certain. I don’t know if we will play for 10 minutes and stop, 40 minutes and stop or whatever. In any case, it will be my job to keep track of time and to signal players one way or the other when we’re within a few minutes of when it feels like a set should end. I gratefully appreciate the willingness of each player to join in this orchestral experiment. Each person’s contribution will be of fundamental importance for how the music organically transpires.